While on our London jollies at the weekend, we also spent a good chunk of Friday navigating the Westfield Shopping Centre in Shepards Bush. Take it as someone who lives in close proximity to the huge Blanchardstown Centre - that place is GINORMOUS. 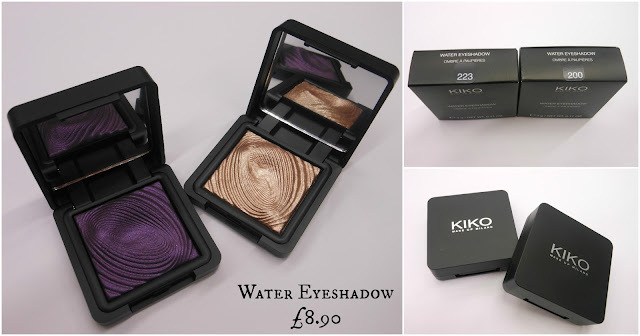 One shop I was thrilled to see was KIKO, having heard so much on the beauty blog circuit about their budget friendly and great quality products. Their products are not all cheap as chips by the by but I did manage to pick up some goods before the Sis physically jostled me from the premises. First, I was an inordinate amount of time trying to decide between 32 'Have the Eye Out of Your Head' Water Eyeshadow shades. These spectacularly vibrant shadows are developed to be used wet or dry and while not 'cheap' at the price, are well worth a tenner each. Their ergonomic design means you get a perfect swipe of colour first time, every time. 223 reminds me very much of the newest Estée Lauder Violet Underground collection. 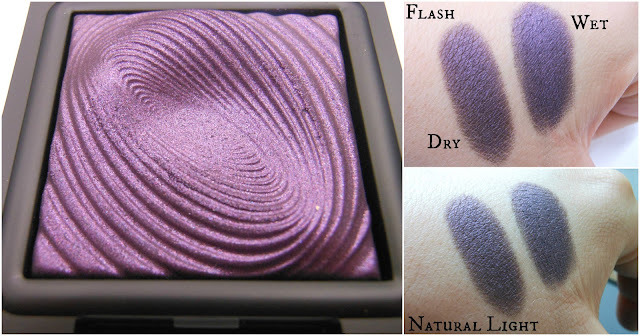 Densely pigmented and true to pan even without wet application, this beautiful purple will be a welcome addition to my collection. 200 is as close a dupe to my beloved MAC SuperWatt as I've found yet. 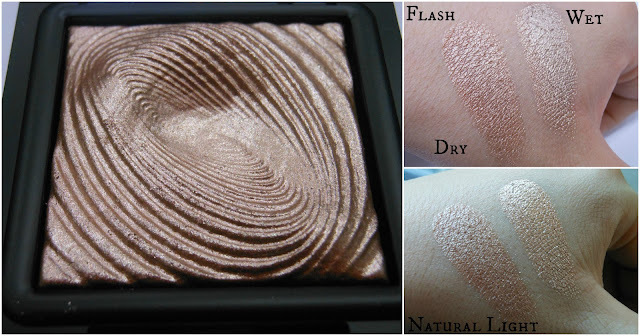 Super soft to the touch and with no fall out whatsoever this champagne golden taupe will act as a perfect highlighter as well as a bright wash of light in its intended purpose as a shadow. I had to snap up Volumeyes at half price. This deep intense black makes full use of the densely packed brush to add volume without clumps to lashes and may be my favourite budget mascara in a very long time. I'll be featuring this in a Budget v Blowout post vay soon! 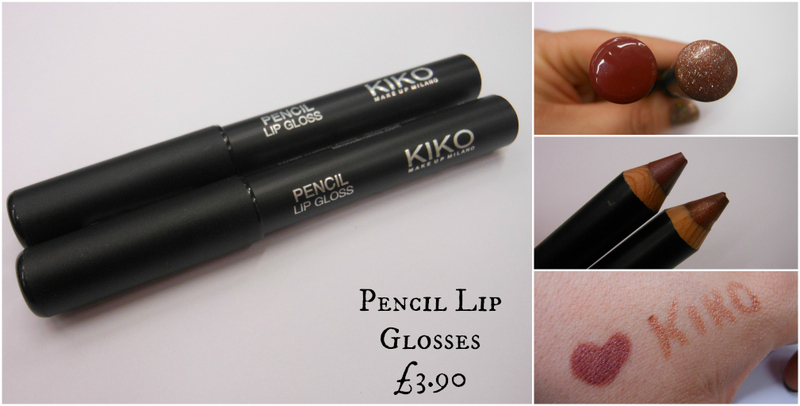 Last but certainly not least are these gorgeous Pencil Lip Glosses that were temptingly placed by the tills. I had 5 in my hand but sense got the better of me. As I was pondering the ever helpful Shop Assistant pointed out that she was wearing shade 12 (Wine Red) and her colleague 03 (Glitter Bronze) if that helped and it did. I bought both immediately. 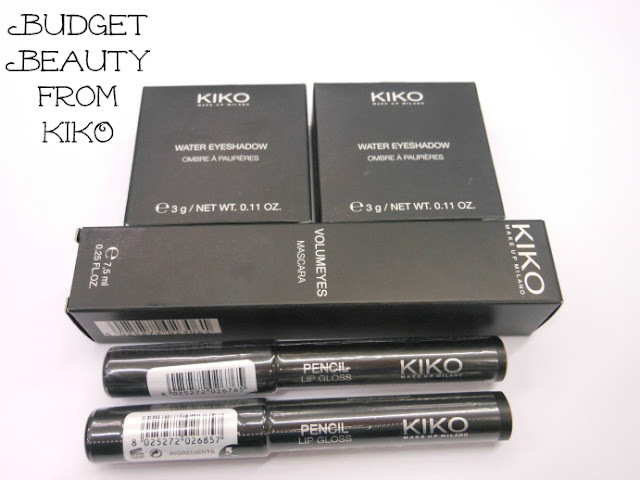 They're unlike any lip pencil I've used before, settling as a glossy, pigmented and moisturising colour once on the lips. Kicking myself now I didn't get the other three. And that rounds up my picks. The Sis bought several other lovelies, including some much raved about polish but, truly, I was being good. Thing is now I know the quality is so good, all bets are off when I spot a KIKO store on our next Euro tour. Have you tried the brand before? Liking the cut of their jib? Oh damned!! just found their online site with free shipping. Oh well...must have those Water Eye things. Wow, those are some amazing eyeshadows. Spotted Kiko in Milan (I think that's where it's based) and was very impressed. Never tried, but I very much like the look of this mascara brush! And the shadows are so pretty!